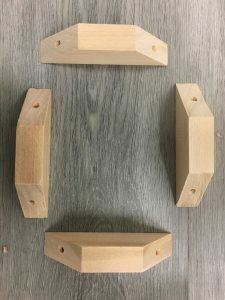 This review will be covering the inner machinations of the Elegant White Shaker cabinet from RTAcabinetstore.com. 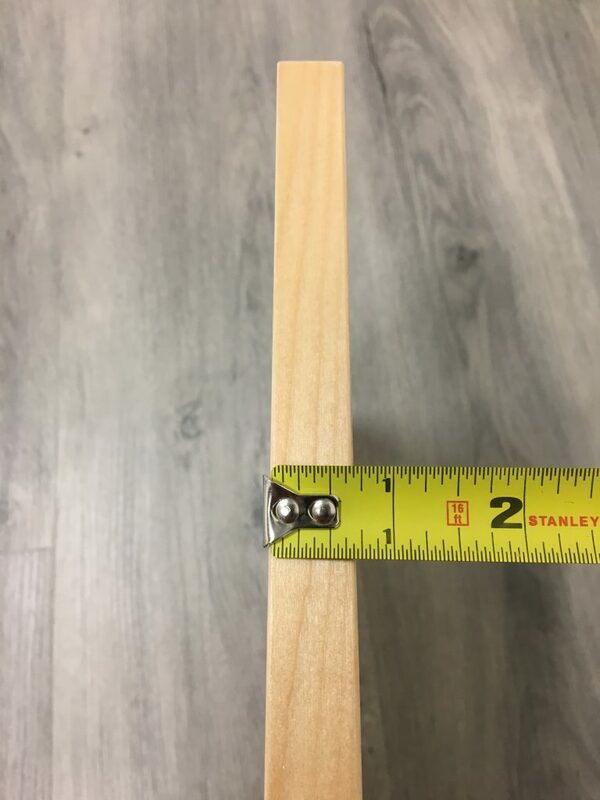 As is with every cabinet we assemble and review on this site, both the positive and negative characteristics will be explored and included when determining the ultimate grade for this cabinet based on the scoring system we have developed to rate these units. The Elegant arrived within the allotted 5 to 7 business days advertised on the Rtacabinetstore.com’s website. 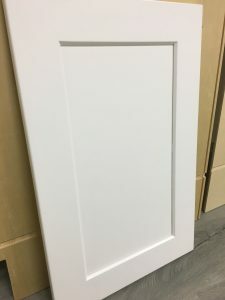 With the exception of the cabinet’s face frame, both the door as well as the drawer face are composed of a “high-grade Medium-density fibreboard” (MDF) according to the RTAcabinetstore.com’s website. The cabinet frame is a hardwood, likely birch, and is well-constructed. Built with the five-piece cope-and-stick method for which Shaker cabinets are known, the MDF of the drawer face and door are intended to prevent warping and cracking of the paint, but the nature of this composite “wood” is not as strong as a natural hardwood to the wear and tear of regular use (Picture 1–right). The finish of the paint on the face of this cabinet is a crisp, white hue that brilliantly holds the natural light. 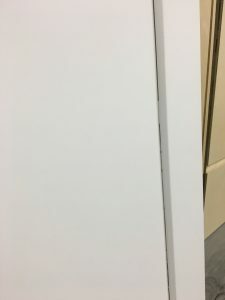 The only incongruities visible on the door itself are found in the crevice where the door frame meets the middle panel: the paint is seen messily set in the space between the two pieces of MDF (Picture 2–left). 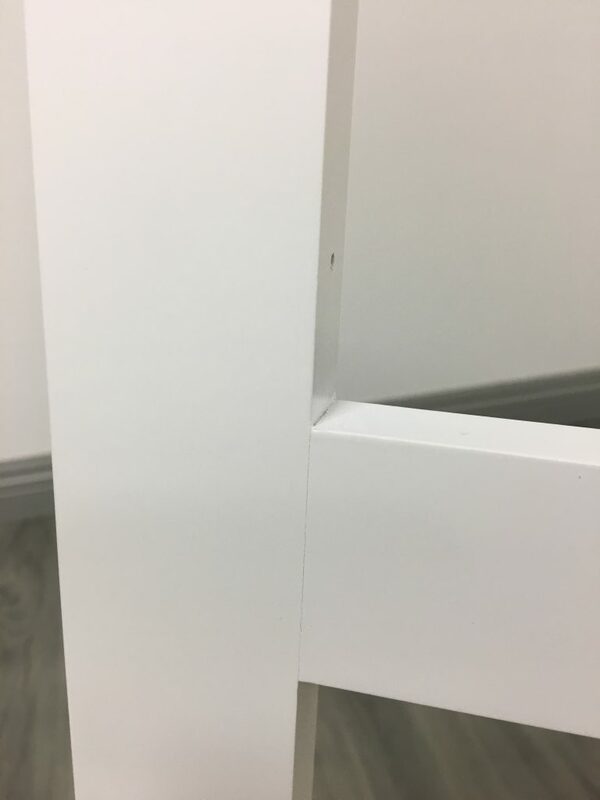 This evinces that the paint has been applied to the door following assembly rather than to each piece individually prior to fixing the door together. In each of the four corners are minor cracks where the cope-and-stick joints are located, but these are only slightly visible under the heaviest scrutiny. The top of the drawer face exhibits a dark mark along the inside where the drawer face meets the frame (Picture 3–below, left). I trying to wipe this mark away using cleaning products and lukewarm water with a paper towel but it appears to be a permanent mar on the top surface of the drawer face. The hardwood cabinet frame displays several cracks in the paint both above and below the opening for the drawer box (Picture 4–below, right). 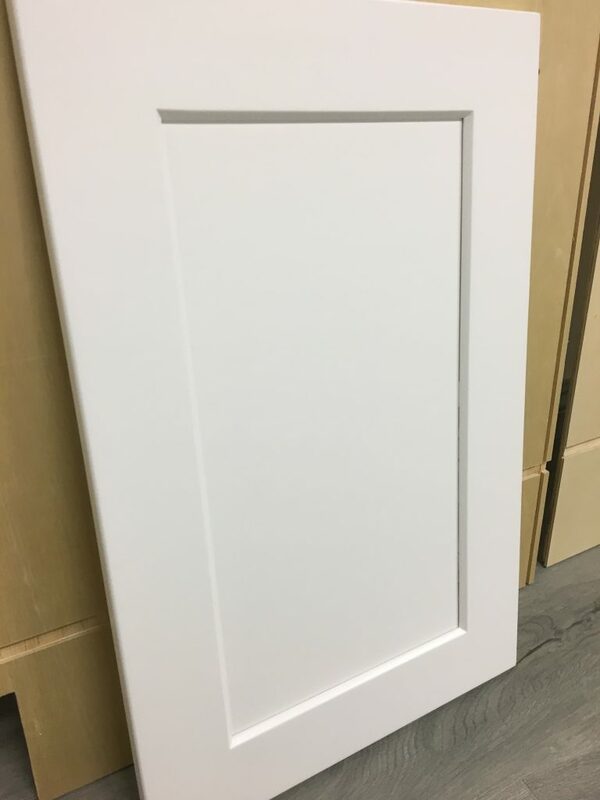 While the hue of the finish is a fresh white, the unit could use another layer and each piece of the door to be painted individually for a cleaner look overall. The Elegant White Shaker showcases a stained white exterior to match the face of the cabinet. Both side panels have this stain, and the plywood used in their construction is a high-quality product—the same plywood can be found with the full back panel, which has a natural wood finish to it, both inside as well as exterior (Picture 5–left). The laminate veneer of the interior box also has a natural wood look to it, sleek and smooth enough on the surface to easily clean when habitual use over time causes normal accumulation of superficial marks (Picture 6–above, right). The overall finish of the box, interior and exterior, is a nice stain and laminate but is lacking in the overall quality of material used in completing the finish. 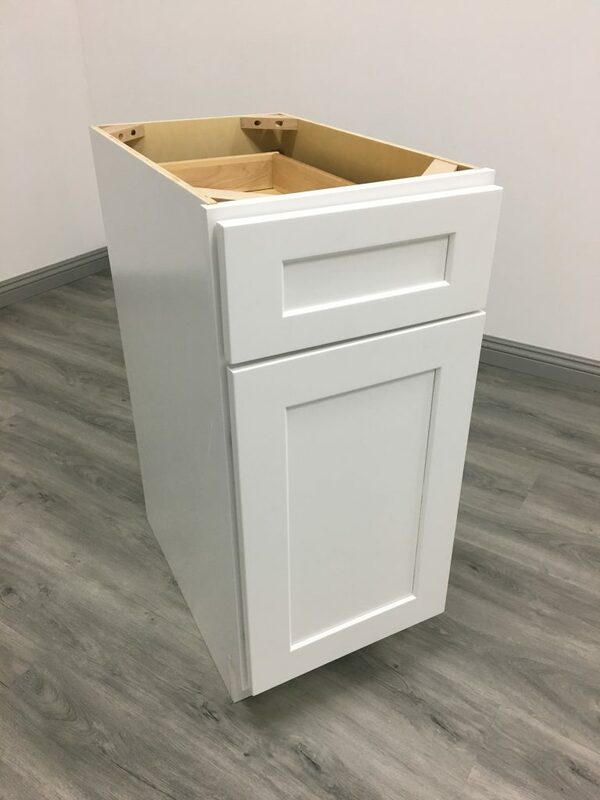 As previously stated, the Elegant White Shaker boasts a full-back panel that fits into the side panels utilizing a tongue-in-groove style. The full-back panel is not a feature typically seen among B15 white shakers, so the Elegant White Shaker deserves accolades for this quality. 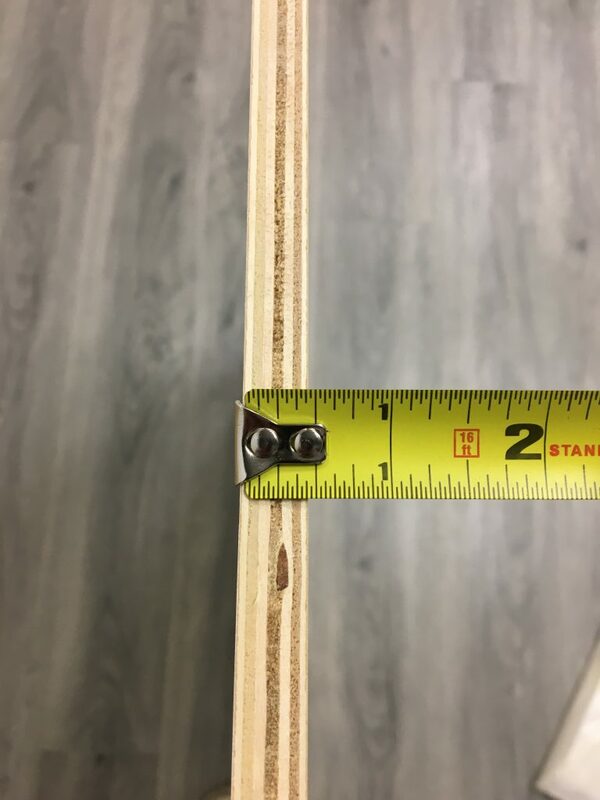 All three of these panels, as well as the bottom panel, measure a ½ inch in thickness, which is rather thin but the quality of the plywood compensates for the thickness of the panel (Picture 7, 8–below, left and center). 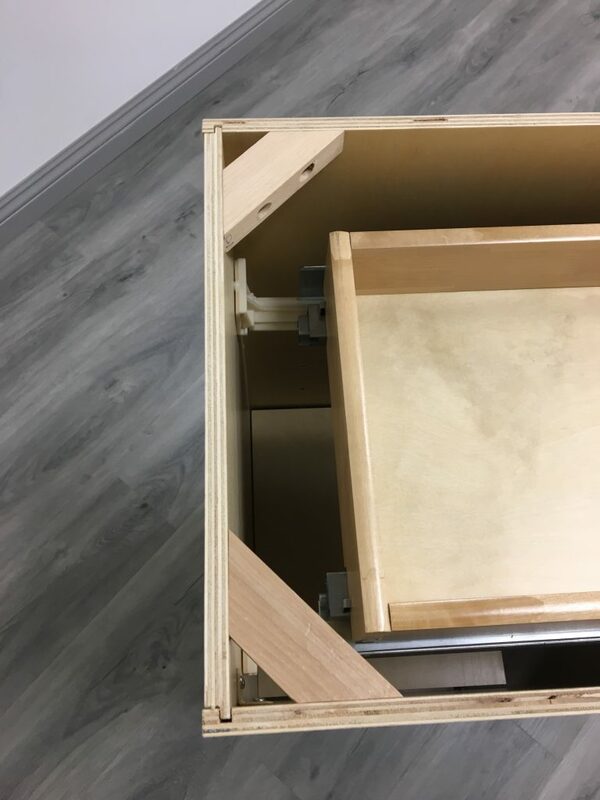 The biggest issue with the cabinet box is that the back panel does not fit snug into the tongue-and-groove joints (Picture 9–below, right). This contributes to the instability of the box and creates a noticeable wobble at the base of the cabinet. 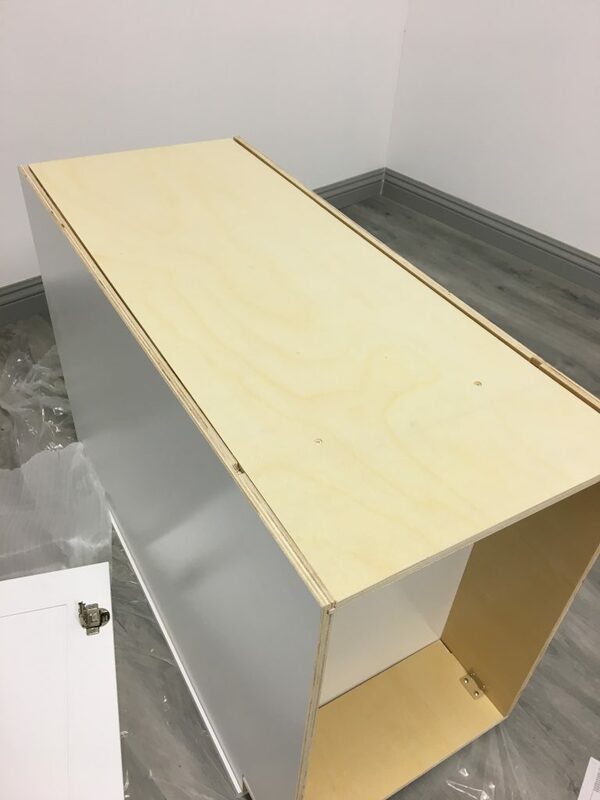 Pre-packaged with the frame and cabinet door, the drawer box frame has the front panel attached to the drawer face when it arrives. The side panels measure 5/8 inches in thickness (Picture 10–below, left), with the bottom panel clocking in at an industry standard 3/8 inches (Picture 11–below, ceter). 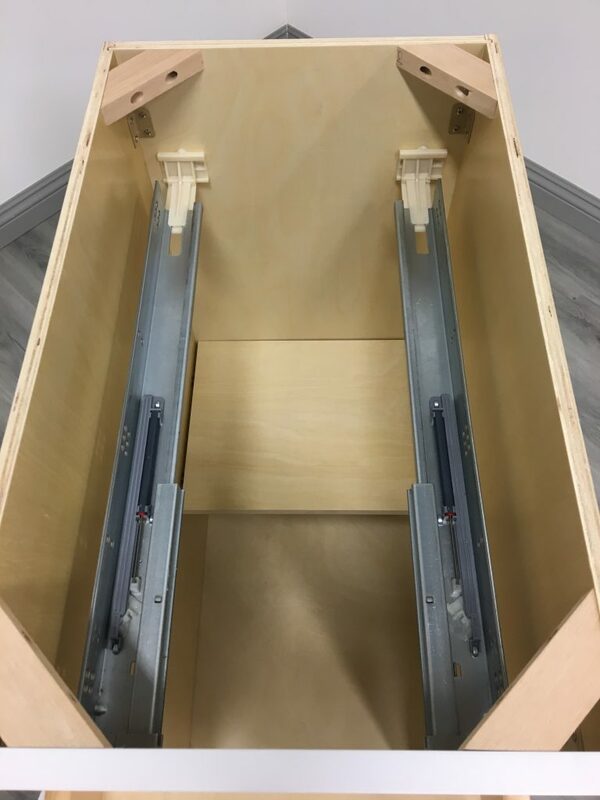 As we’ve seen with several other drawer boxes in units we’ve reviewed, all four panels display an arch-top molding that makes for an awkward joint assembly. The dovetailing on this box at the joints is weak, with the panels capable of being pulled apart by hand without much effort (Picture 12–below, right). Wood glue would be highly suggested for stabilizing this box, as it will undoubtedly fall apart after a short time of regular wear and tear. We are still holding out for the day the elusive “frameless” (also known as “flush-frame”) cabinet, and unfortunately we don’t see it with the Elegant White Shaker. This does not count against the unit, as a “hanging frame” is industry standard. 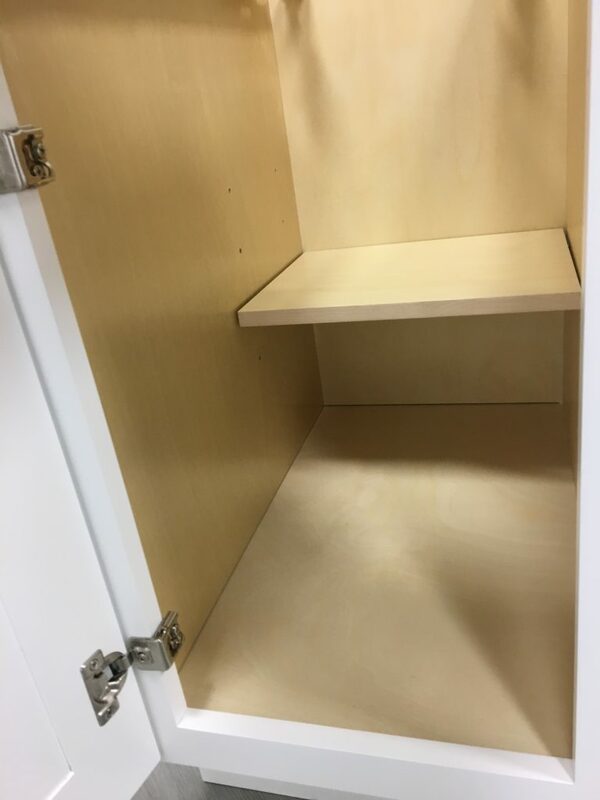 The storage for this cabinet is still, however, rather disappointing. 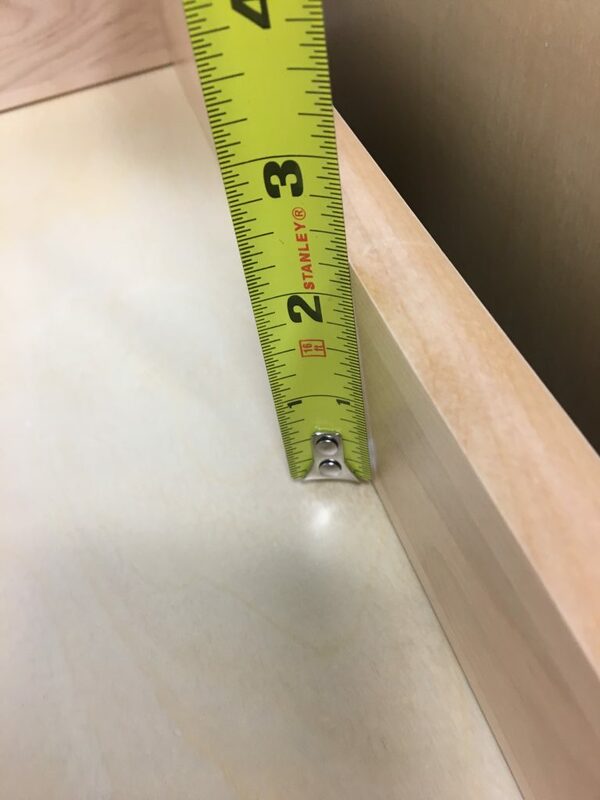 In addition to the flimsy construction of the drawer box, the depth of storage it offers is a meager 2 and 3/8 inches deep (Picture 13–right). The only other cabinet we have assembled and reviewed to this point offering the same lack of depth is the Brilliant White Shaker from theRTAstore.com (Brilliant Shaker Drawer Box). 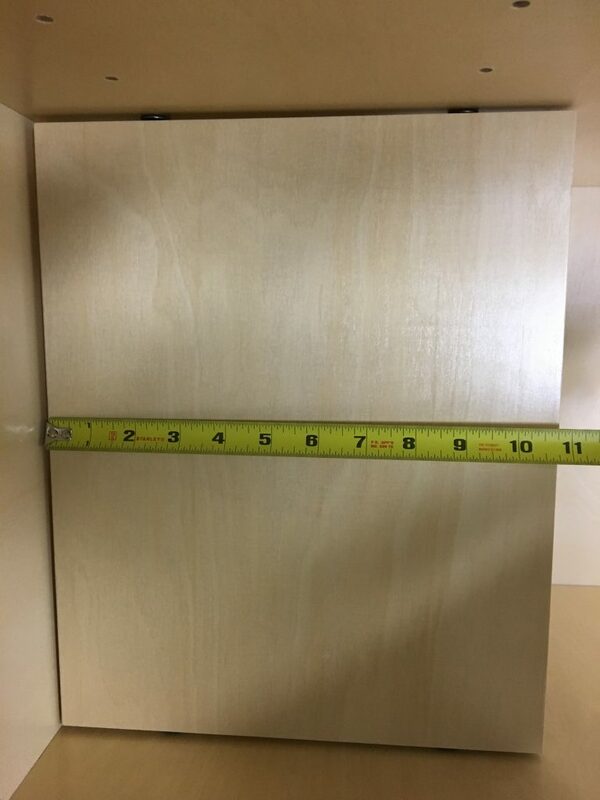 The hanging shelf of the unit is also rather disappointing, measuring only 10 ¾ inches in length thus occupying less than half the depth of the cabinet box (Picture 14–below, left). 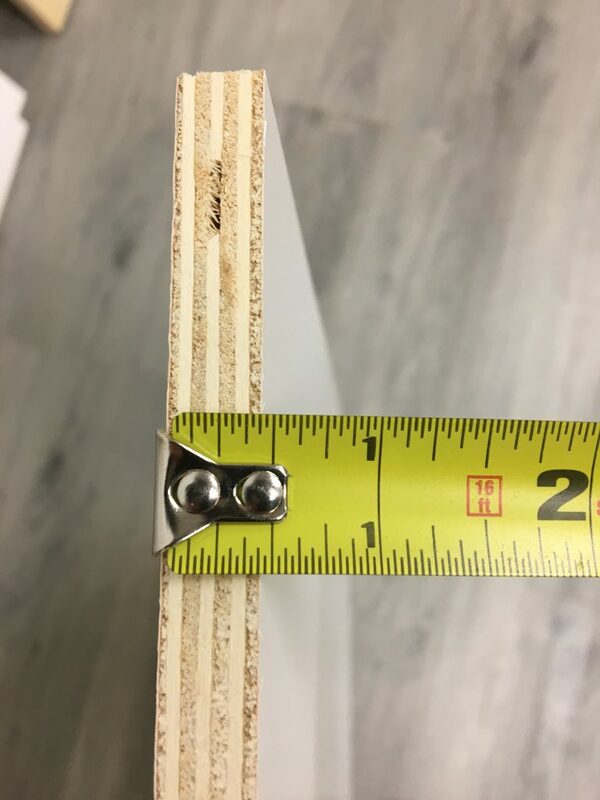 With an industry standard thickness of ¾ inches, the shelf does offer some redeeming qualities (Picture 15–below, center). 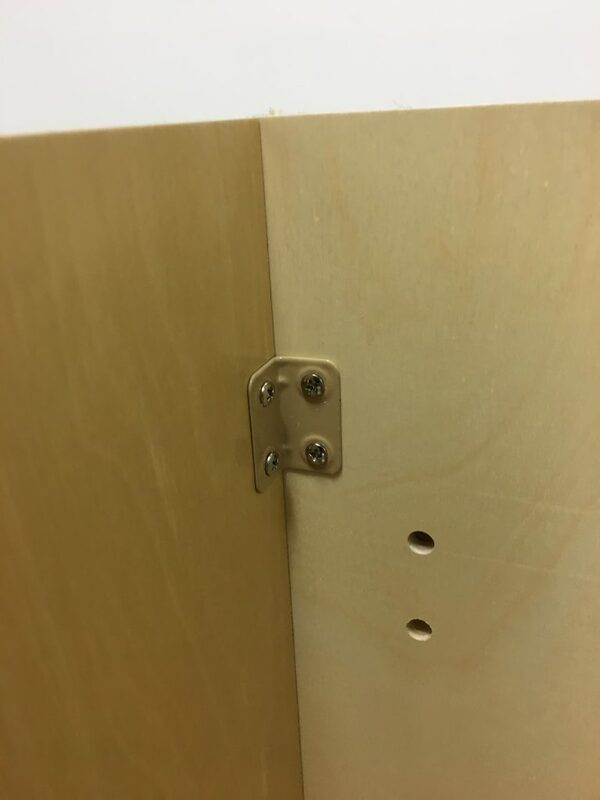 The pegs holding it in place are metal and admittedly a higher grade than the plastic clips we have seen holding in place the hanging shelves of other shaker cabinets. 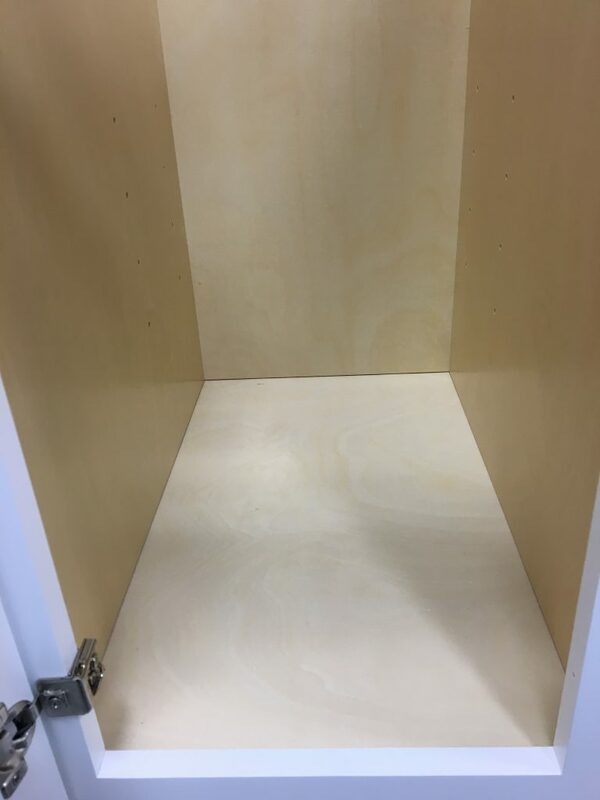 Another positive feature of this particular shelf is the four finished sides, complete with a laminate veneer and capable of being flipped over and reversed (Picture 16–below, right). This feature is rare among the floating shelves of B15 cabinets and certainly is worth giving due diligence and credit to the Elegant White Shaker. 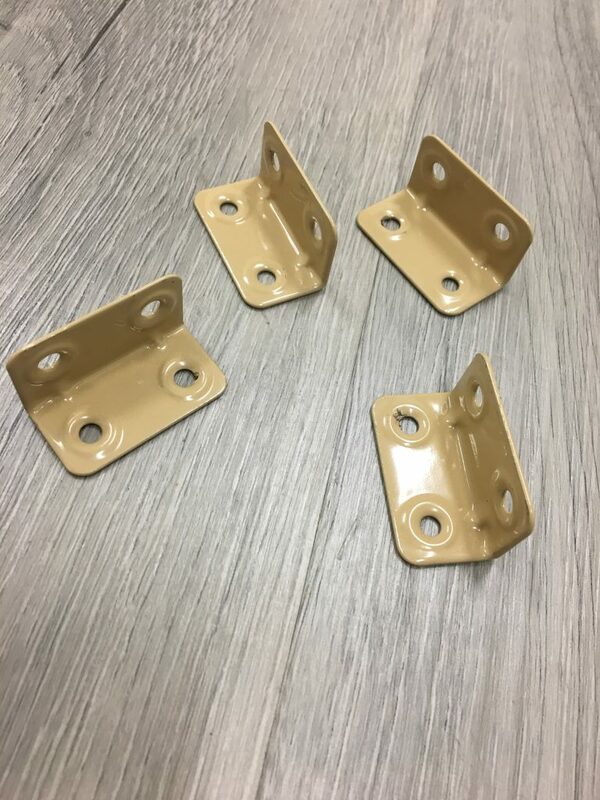 These hinges gave cause for me to raise an eyebrow or two: it is typically considered industry standard to ship door hinges pre-attached to the door, and just as frequently to both the door and the cabinet frame. 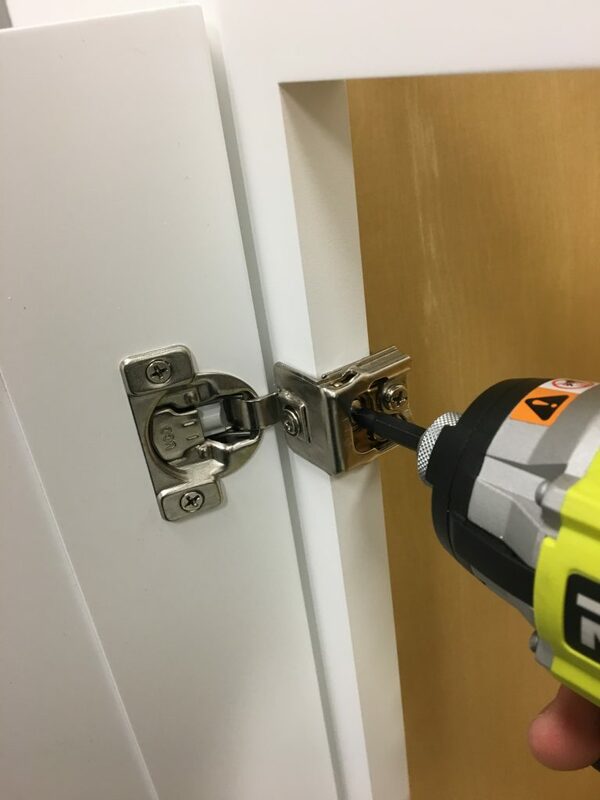 This saves time as well as reduces the risk of damaging the door or frame when assembling. 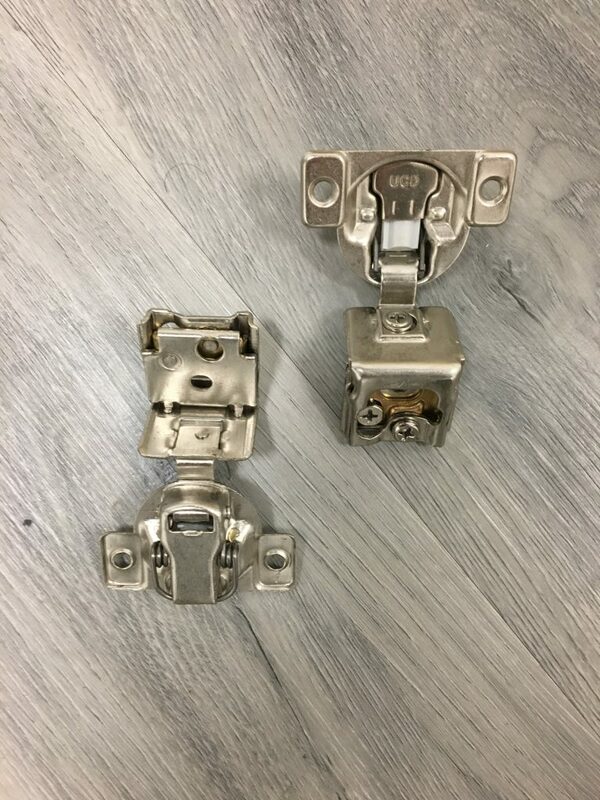 These hinges came separately packaged and required mounting from the individual building the unit (Picture 17, 18, 19–below; left, center, right). While this doesn’t count against the grade of the unit, it is worth noting and taking into consideration when shopping for a cabinet. The most important point of contention with these hinges lies within the functioning (or lack thereof) of the Soft-close mechanisms. 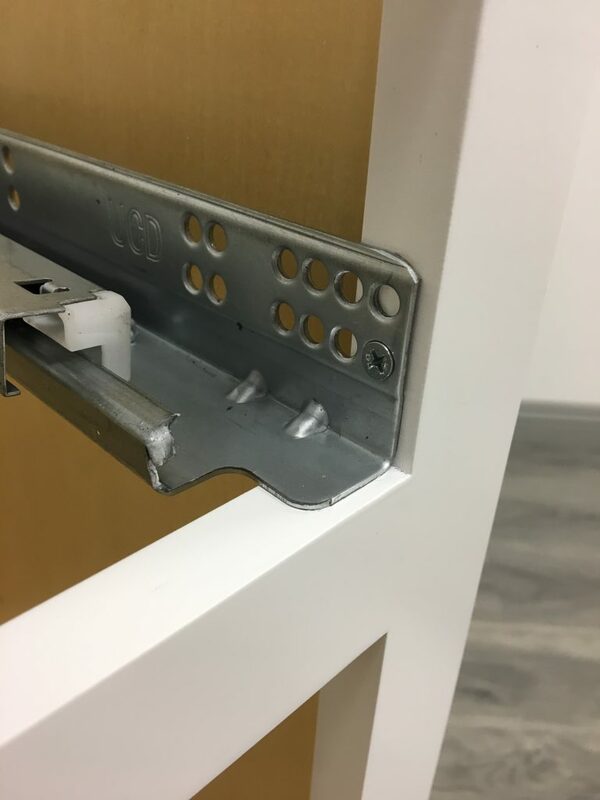 SCMs typically allow for the door of the cabinet to ease shut without noise or force, and while these hinges come equipped with the mechanisms, they do not work properly each time the door is shut. 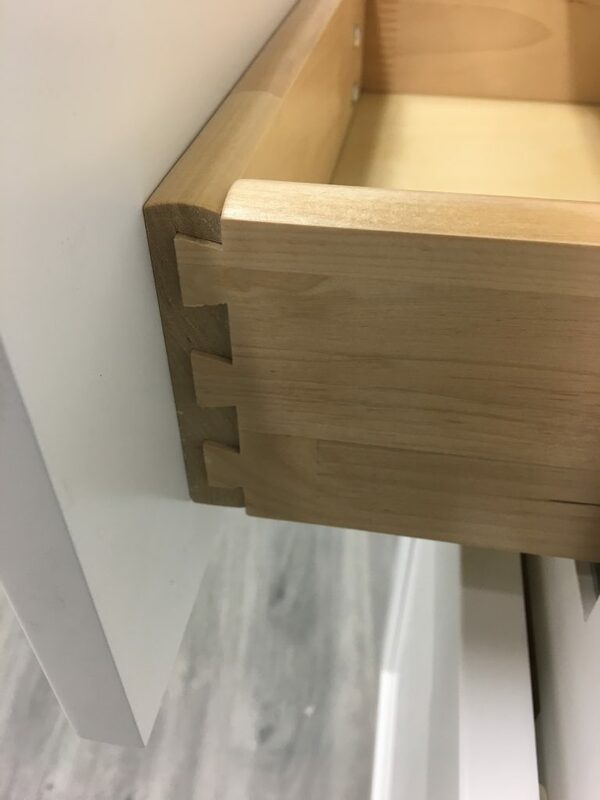 In contrast to the SCMs found in the hinges of the door, the SCMs of the drawer glides work quite well in preventing the drawer face from slamming into the cabinet’s frame (Picture 20–below, left). The full extension glides mount to the front of the unit with wood screws being fed into pilot holes (Pictures 21, 22–below, center left and right). 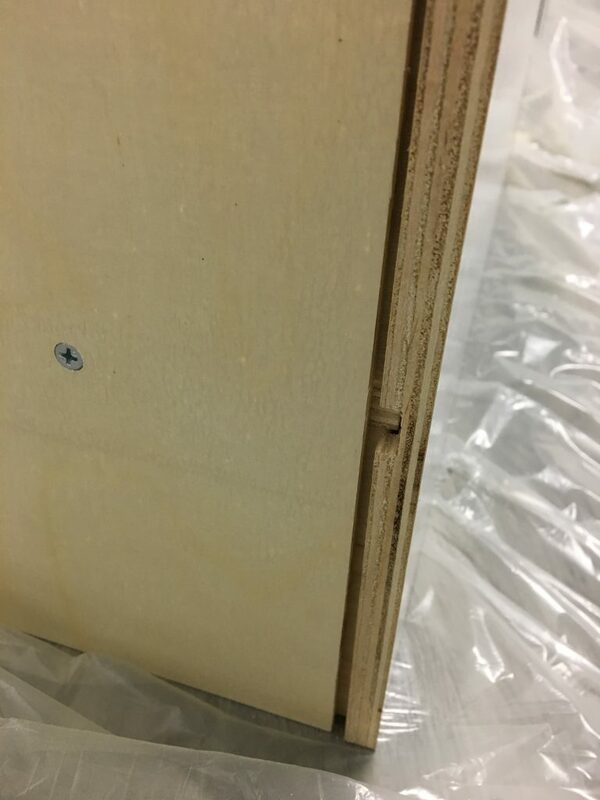 These pilot holes expedite the assembly process and ensure the proper alignment of the glides with the plastic anchors fastened at the back of the Elegant White Shaker’s box. 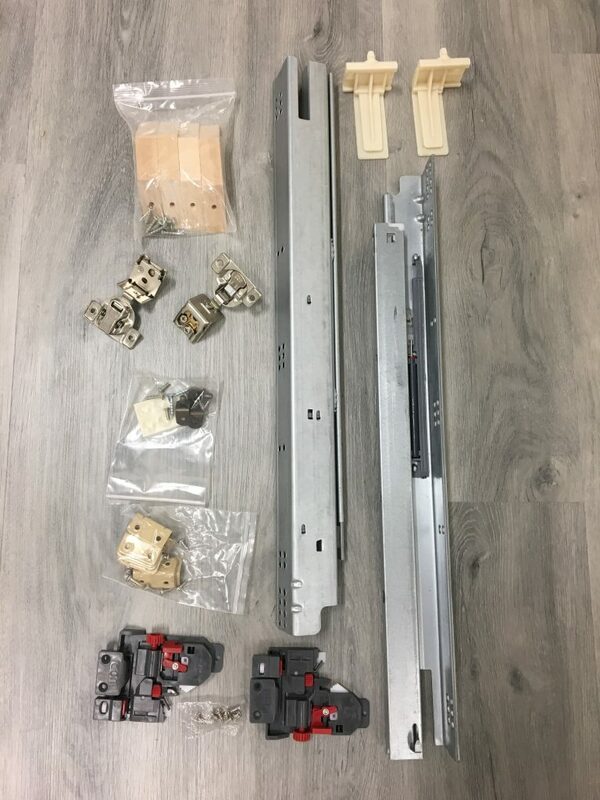 The only issues I found with these particular under mount drawer slides is that the left track is shaky and the plastic clips which connect the fronts of the glides to the drawer box are large, awkward, as well as clunky (Picture 23–below, right). 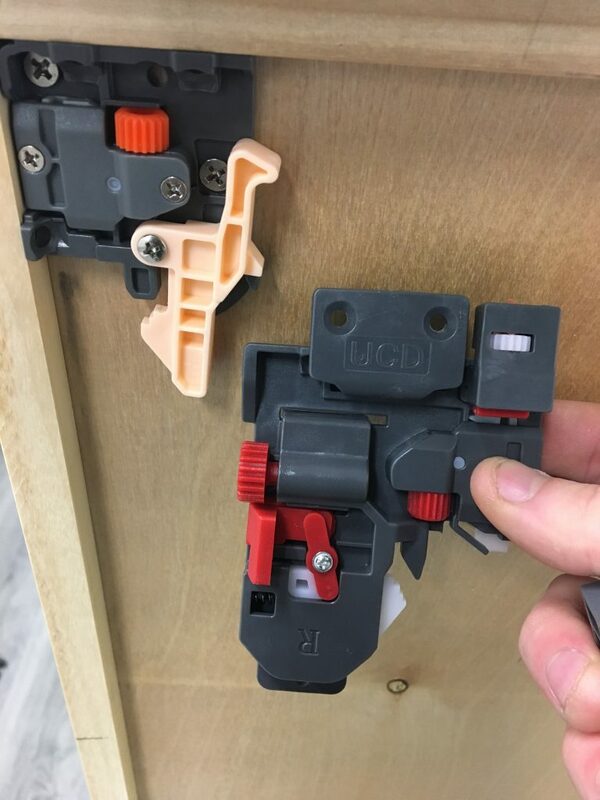 The advantage is the means in which they attach to the box: rather than screwing into the bottom panel, these clips are fastened to the box through the underside of the front panel attached to the drawer face. This approach ensures the drawer glides are securely fastened to the box and benefit the stability of the tracks. 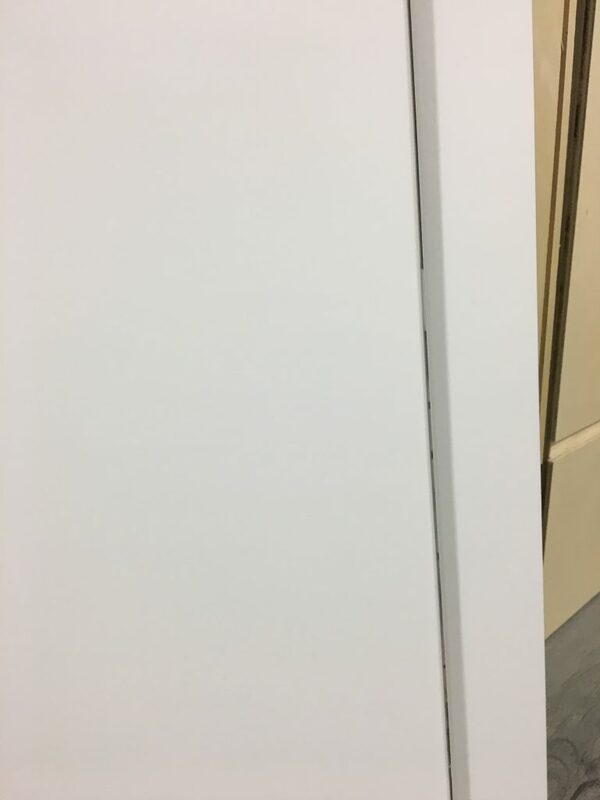 There are several different types of connecting parts with the Elegant White that hold this cabinet together. 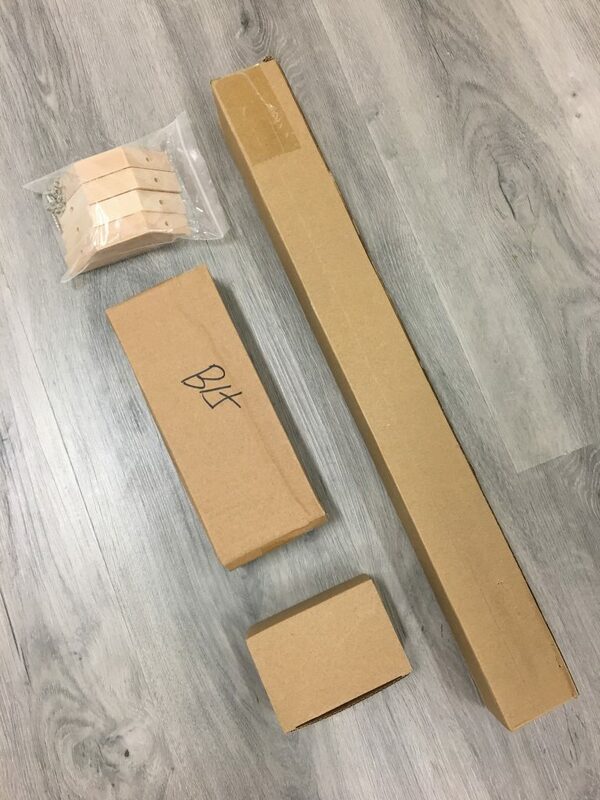 These are all separated and organized in their respective packaging, making it quite easy to keep track of every item included with the unit (Picture 24–above). 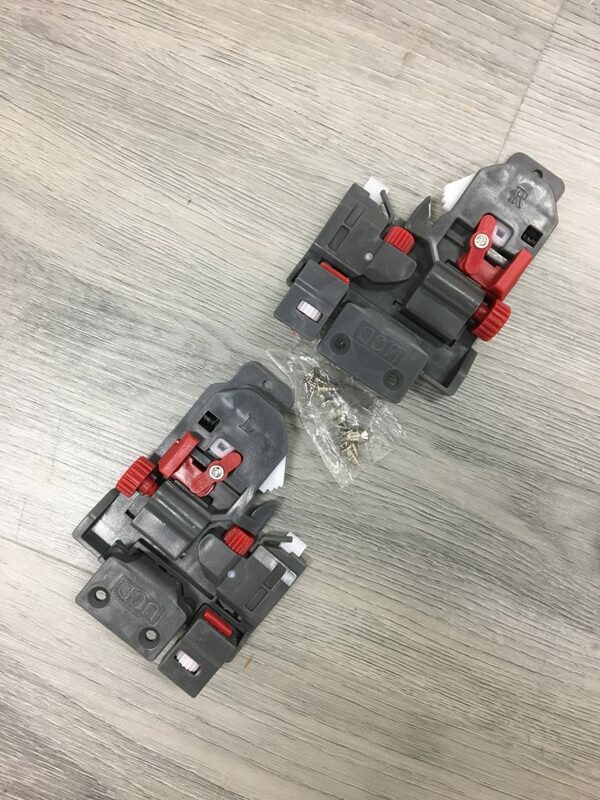 As pointed out in the previous section, compared to the plastic mounting clips found on the underside of other units, these are rather clumsy and large (Picture 25, 26–left, right). They arrive with two plastic packets of wood screws, so there is plenty of hardware to attach the clips with spares left over. 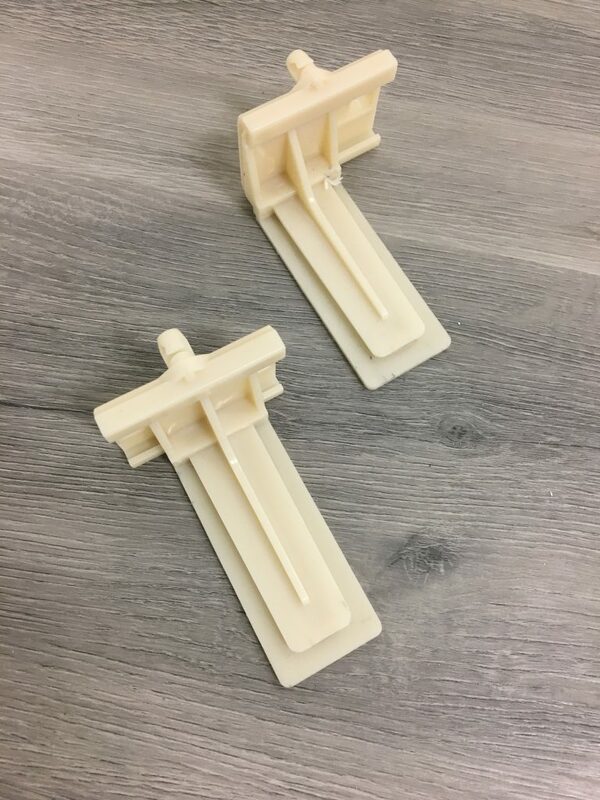 The plastic anchors supporting the drawer glides are a lower quality than what we are used to seeing in white shakers (Picture 27–below, left). 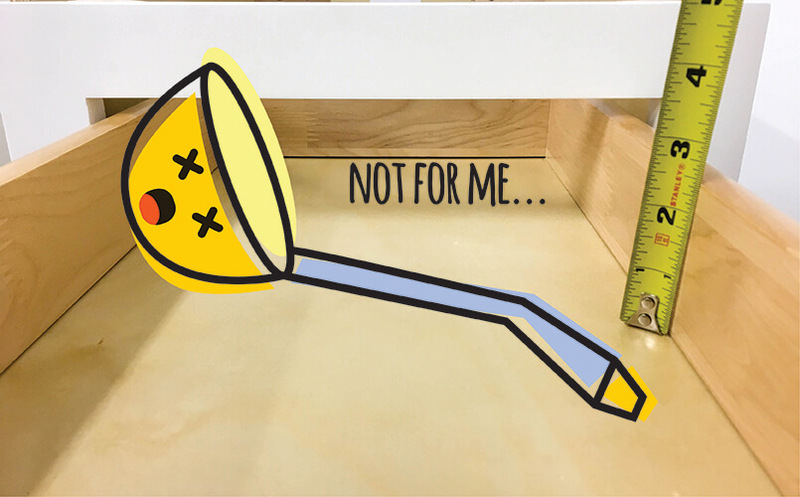 Supporting only ½ an inch of the end of the drawer glide, these anchors do little to stabilize the drawer as it is pulled and pushed in and out of the cabinet box. Holding together the panels of the Elegant White Shaker are a number of beige-colored “L” brackets, also known as “cleats” (Picture 28–below, right). 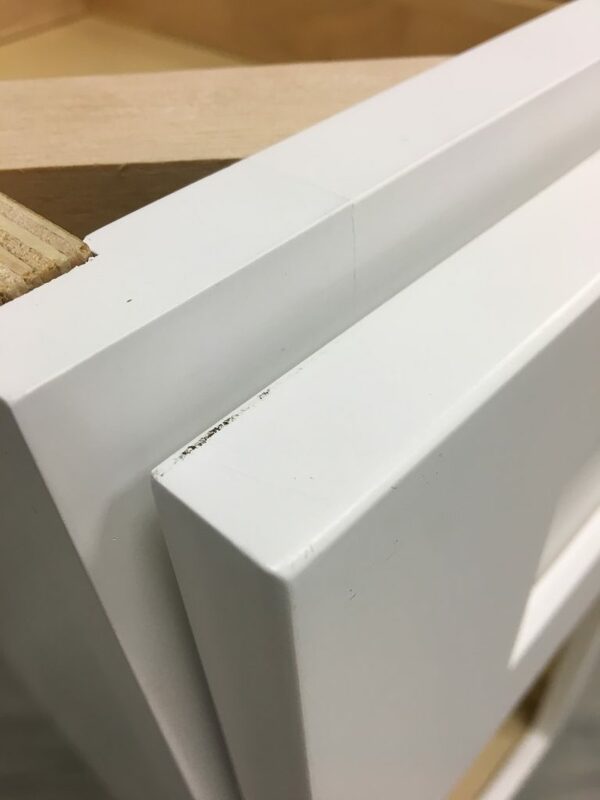 Rather than snapping into pre-fastened lips, as we’ve seen with several of our previous white shaker models, these “L” brackets require wood screws to be fitted into pilot holes located on both the side and back panels. These can be challenging to hold in place with one set of hands but is manageable. Also, the beige coloring of the brackets adds to the continuity of the interior natural wood laminate. 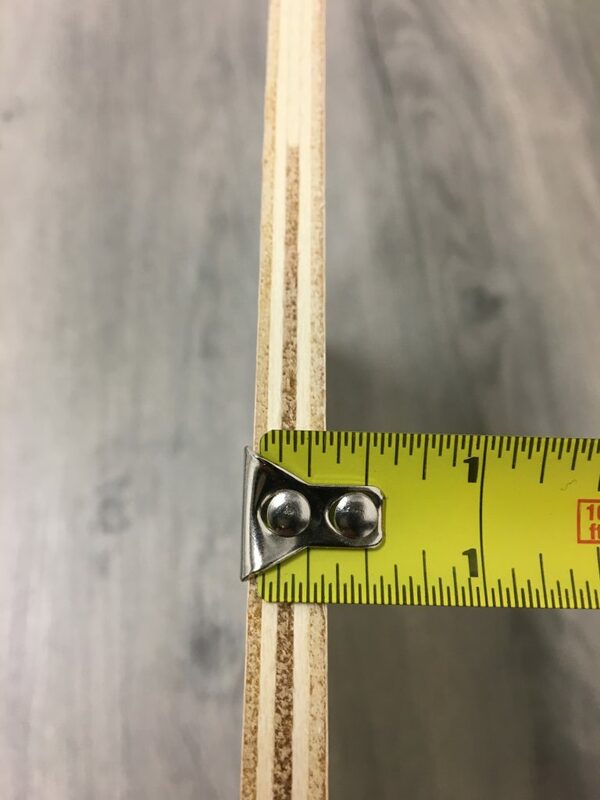 Another positive element of the connecting parts is the wooden corner joints. 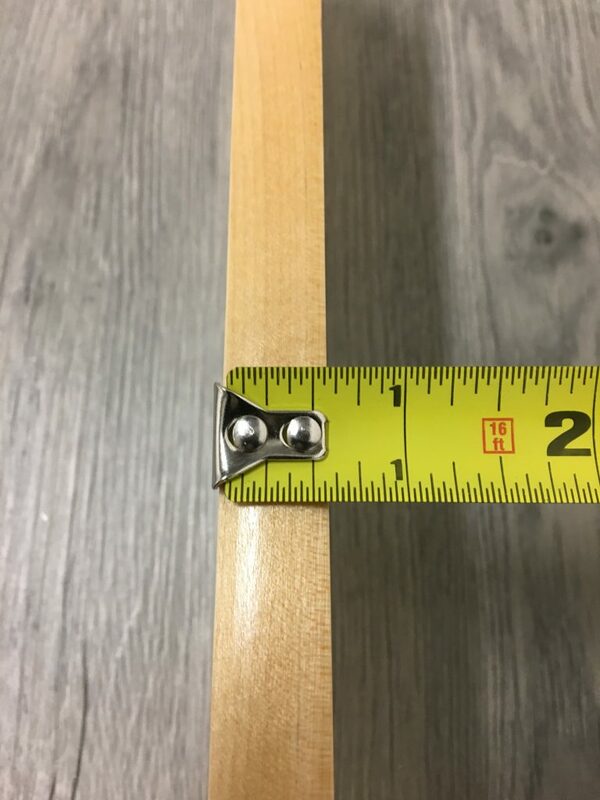 Typically included are opaque plastic braces which minimally increases the stability of the cabinet box, but these wooden braces are much more solid and dependable (Picture 29–below). 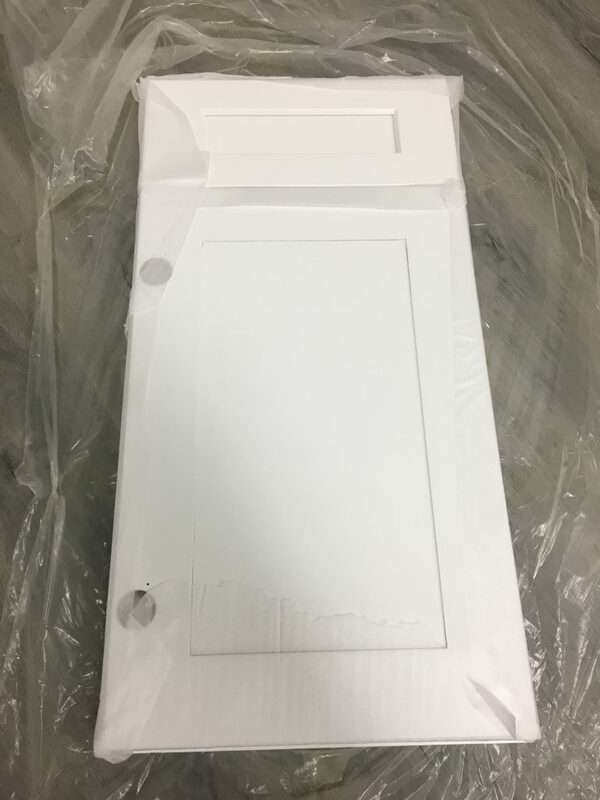 Concerning the exterior packaging of the Elegant White, the cardboard on the outside of the parcel is double-corrugated and wrapped in thick plastic bands (Picture 30–below, left). 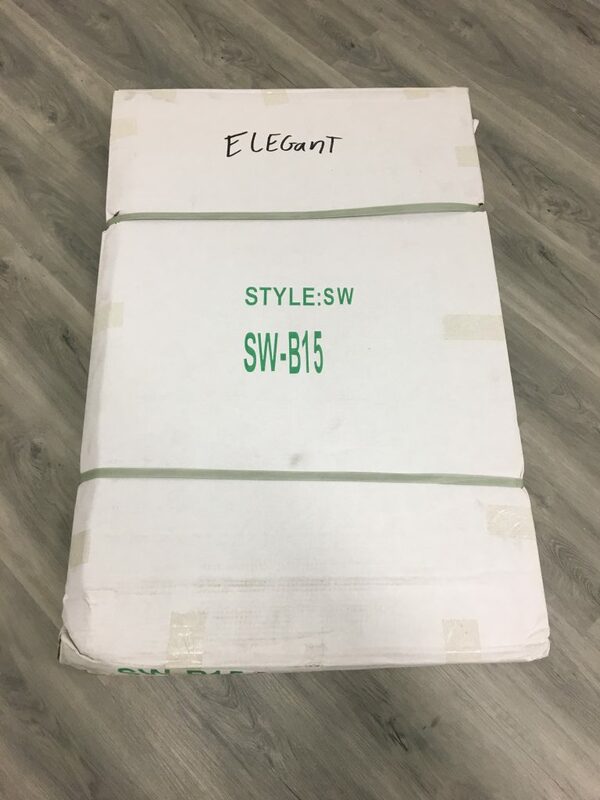 These plastic bands safely secure the exterior cardboard around the arranged pieces inside the parcel as well as making it easier overall to handle. 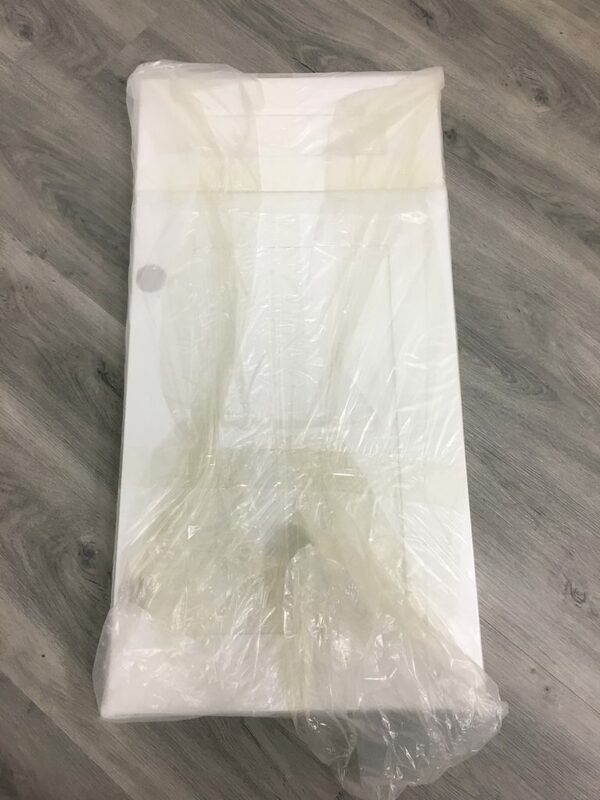 Upon removing the plastic bands and exterior cardboard, we find each item of the unit wrapped in a Styrofoam sheet and bubble wrap encasing the entirety of the cabinet parts (Picture 31, 32–below, center and right). The organization and care taken into the interior packaging is impressive and helps immensely in keeping track of each item during the assembly process. Wrapped separately in hefty plastic are the door, drawer face, and cabinet frame (Picture 33–left). 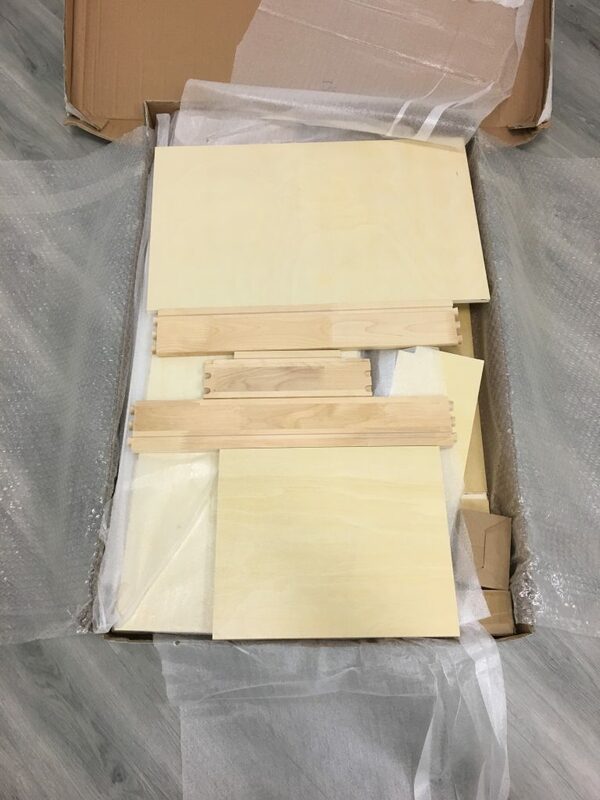 This is a major positive characteristic for the packaging because these items are the most valuable on a cabinet, so going the extra mile to protect them indicates consideration from the manufacturer. 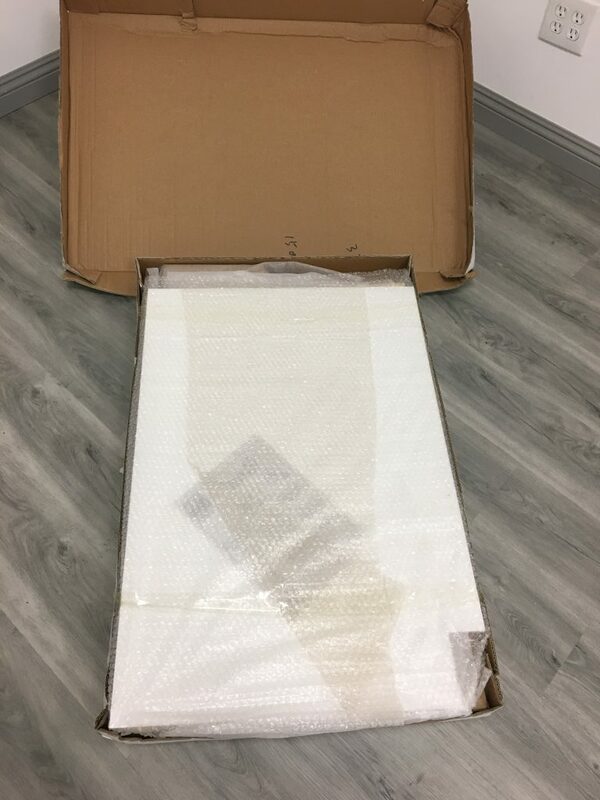 Additionally, thin Styrofoam sheets keep each of the items separated to prevent them from damaging one another during the shipping process (Picture 34–right). Last to be noted regarding the packaging of the Elegant White Shaker are two positive factors: the organized, separated hardware packaged in double-corrugated cardboard (Picture 35–below, left) as well as the picture-instructions with a list of the hardware used in assembling the cabinet (Picture 36–below, right). 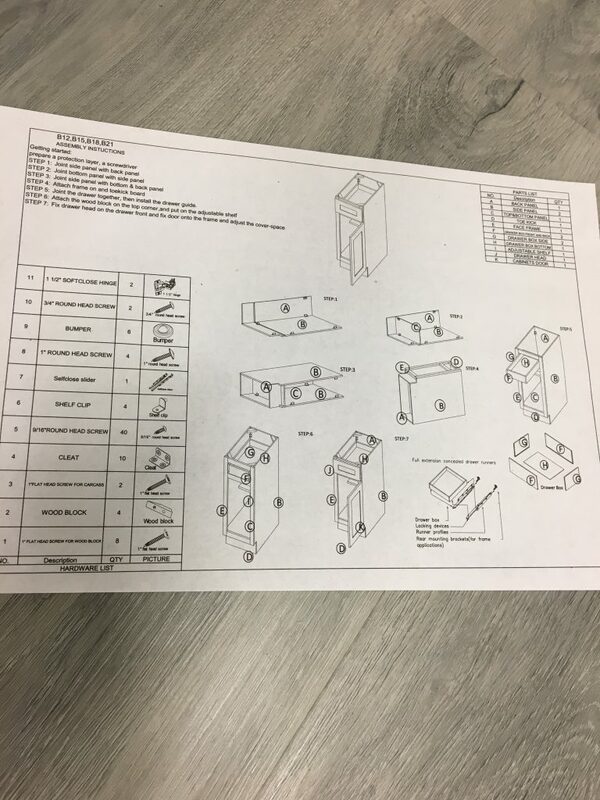 This detailed list of hardware (including the step-by-step picture diagrams) as well as the packaging of said hardware enables a relatively easy assembly, despite the longer amount of time it takes to complete this unit compared to other white shakers we have reviewed on this site. Although I did not follow the step-by-step picture diagrams as they are presented on the instructional page, they are still fairly clear. 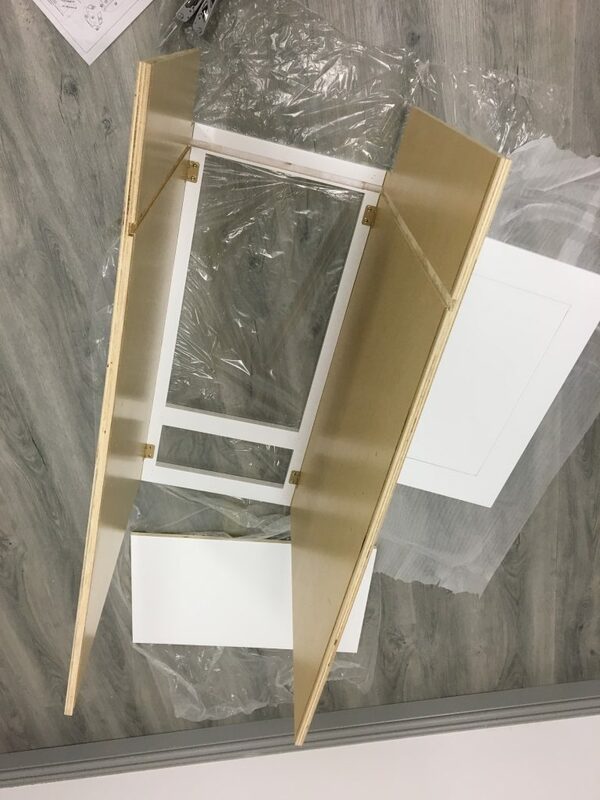 Rather than beginning by attaching the side panel to the back panel as the instructions indicate, I typically begin by attaching both side panels to the cabinet’s frame (Picture 37–right). 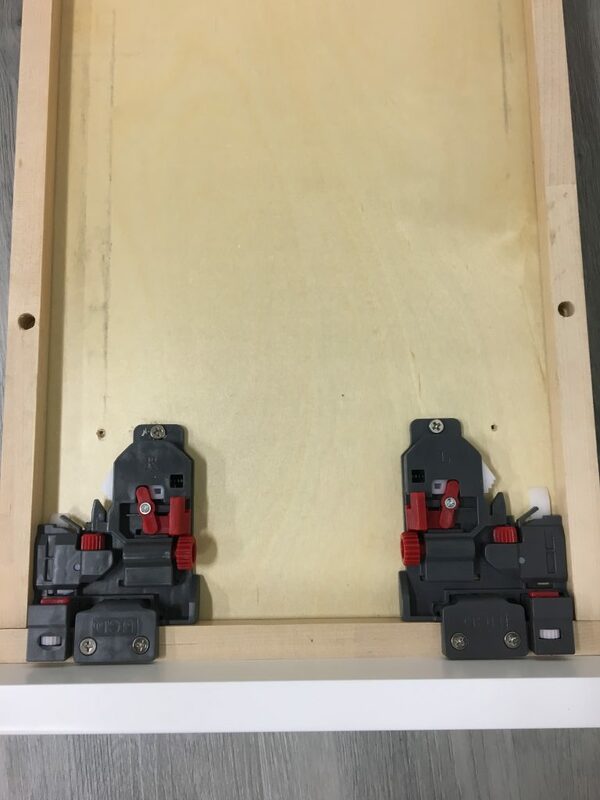 This makes it easier to stabilize the panels when attaching the cleats and allows for the bottom panel to slide into place with more precision than the method suggested by the instructions. Either process will ultimately lead you to the same target in roughly the same amount of time; it is merely a matter of what the individual finds to be the most comfortable method. Each of the “L” brackets is attached to the respective panels by means of wood screws through pilot holes (Picture 38–left). These cleats can be somewhat challenging to hold in place while fixing to the panels, but with patience can be properly held in place. Even with the cleats (10 in total, according to the list of hardware), the sturdiness of the Elegant White Shaker is found to be questionable. Included to add to the stability of the cabinet are four wooden blocks to act as corner braces for the box. While there are no pilot holes to guide the wood screws in for these wood blocks, they are fairly easy to hold in position and guide into the appropriate places in each of the four corners (Picture 39–below). 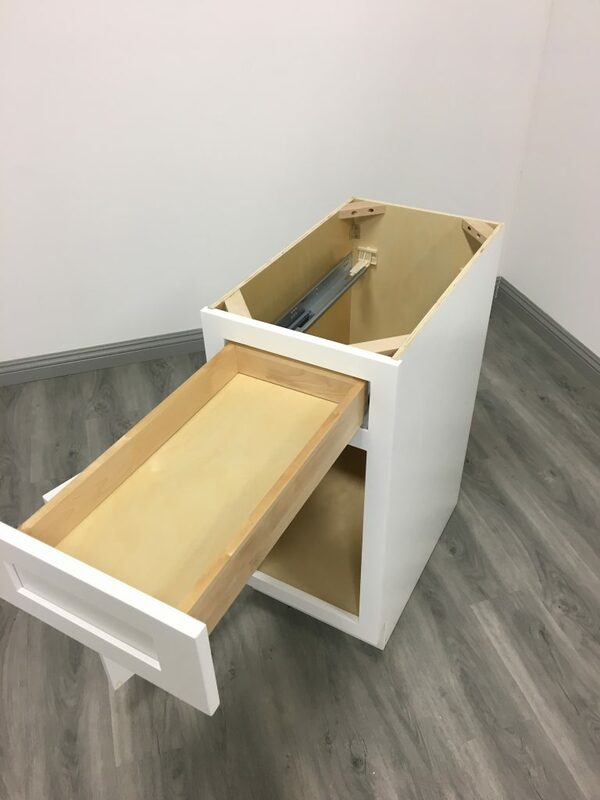 Although the Elegant White requires minimal tools to assemble, the amount of hardware required to piece together this unit is numerous and could potentially prove difficult to keep organized. All this hardware also increases the amount of time required to correctly fit each piece together. With the Elegant White, we face a medium-grade quality cabinet. The positive merits contend with the negative characteristics and provide a unique blend of nice surprises as well as reservations. Quality composition of the plywood used for the panels. Full back panel fitting into the side panels with tongue-in-groove cuts. 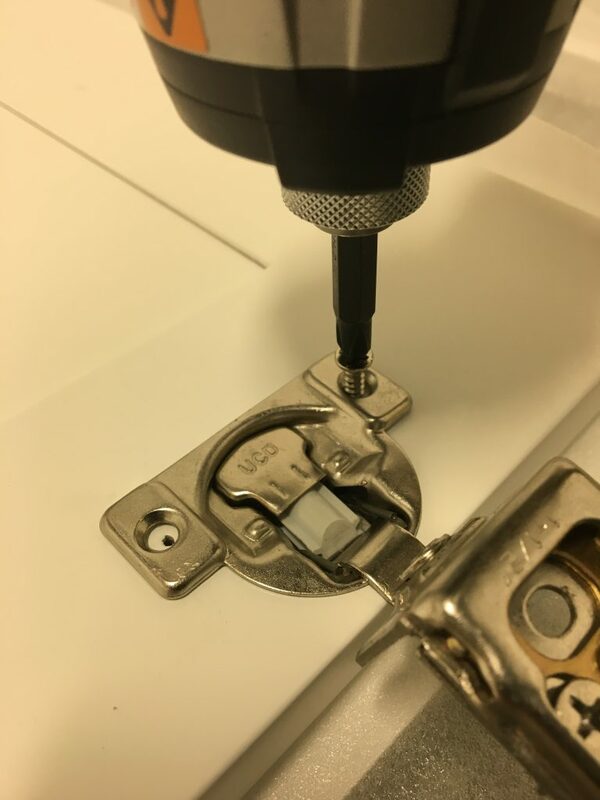 Drawer clips attaching to the front panel of the drawer box rather than the bottom panel, making for a more secure connection. Intricate and considerate packaging to ensure ease-of-handling and safety of the cabinet’s composing pieces. Cracks in paint/finish of the door and frame along the cope-and-stick fittings. Faulty drawer box with loose dovetail fittings and arch-top molding along the tops of the side panels, making for awkward corner joints. Floating half shelf (10 ¾ inches) and shallow drawer box depth (2 and 3/8 inches). Defective soft-close mechanisms in the door hinges. Lengthy assembly process as a result of the sheer amount of hardware. 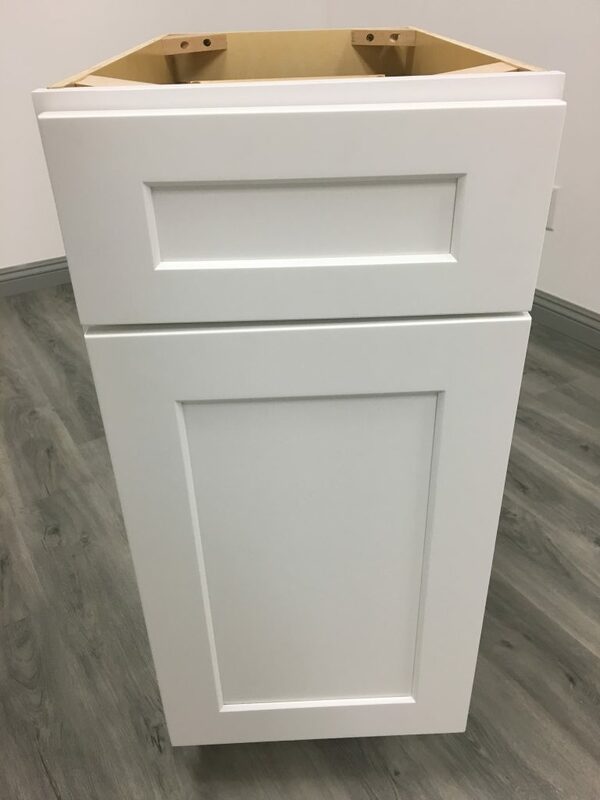 Considering the quality plywood, full back panel, and nice drawer glides alongside the cracks in the finish, shallower drawer box, and prolonged assembly time, the Elegant White is a true example of a cabinet that we recommend for individuals with certain special interests. At a current retail price of $148.78, this RTA unit is a good fit for a kitchen less concerned with storage space or finish and more interested in quality materials composing the cabinet.